Josh is having a hard time learning to share in school. He is especially frustrated when his teacher is busy helping other students. He wants to share his artwork with his teacher and his classmates. He ends up learning why sharing is so important. 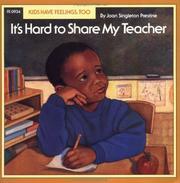 Prestine, Joan Singleton, “It's hard to share my teacher,” Children's Picture Book Database at Miami University, accessed April 23, 2019, https://dlp.lib.miamioh.edu/picturebook/items/show/10361.